The photos must be taken in person by a commercial photographer. Photos must be taken within the last six (6) months. 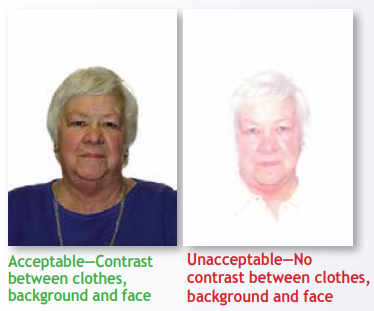 The photos must be taken against a plain white or light-coloured background with enough contrast between the background, facial features and clothing, so that the applicant’s features are clearly distinguishable against the background. 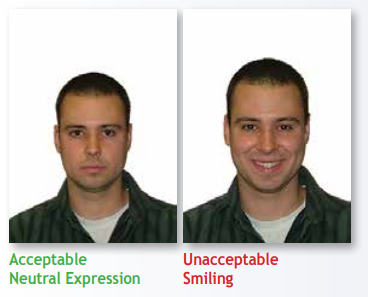 Applicant must show a neutral facial expression (no smiling, mouth closed) and look straight at the camera. The photos must be clear, sharp and in focus. 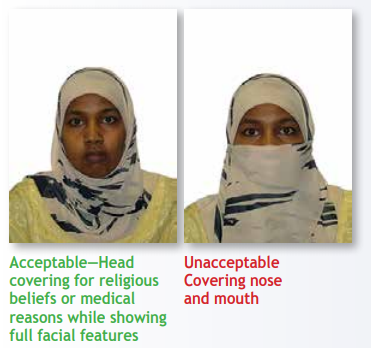 The photos must show a full head without any head covering, unless it is worn for religious beliefs or medical reasons. However, the head covering must not cast shadows on the face and the full face must be clearly visible. Glare and shadows are unacceptable. The lighting must be uniform to avoid glare or shadows across the face or shoulders, around the ears or in the background. 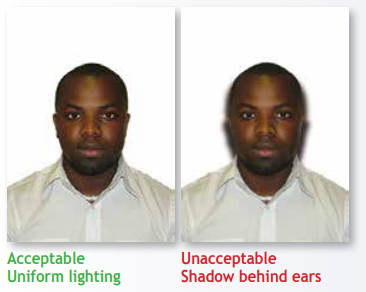 Photos must represent natural skin tones. Eyes must be open and clearly visible. Photos with the red eye effect or red eye alterations are unacceptable. Prescription eyeglasses may be worn as long as the eyes are clearly visible and there is no reflection or glare on the eyeglasses. 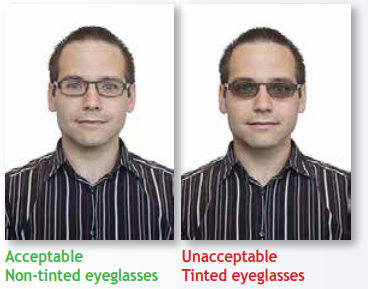 Sunglasses and tinted eyeglasses are unacceptable. 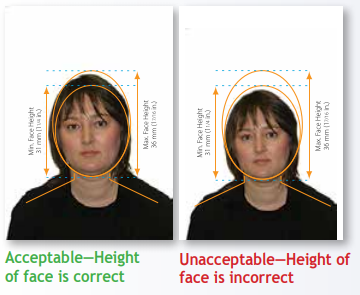 The length of the face on the photos from chin to crown of head (natural top of head) must be between 31 mm (1 1/4 inches) and 36 mm (1 7/16 inches). The photos must measure 50 mm X 70 mm in size (2 inches wide X 23/4 inches long). 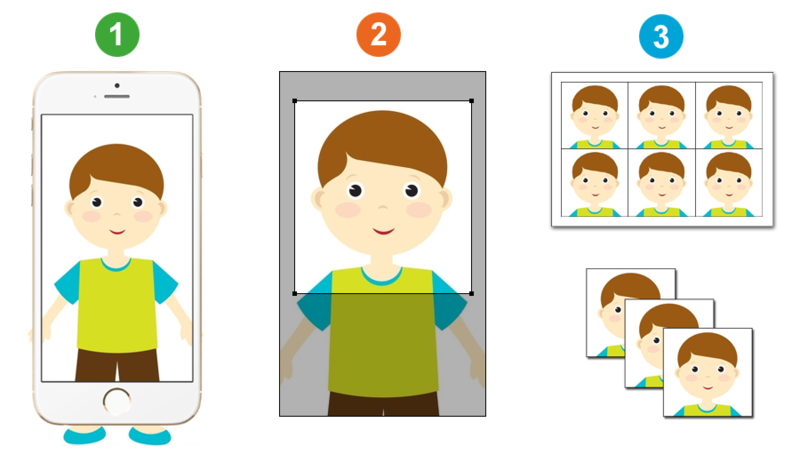 The photos must show a full front view of the face and top of the shoulders squared to the camera (the image of the face and shoulders must be centered in the photo). The head must not be tilted to the side. 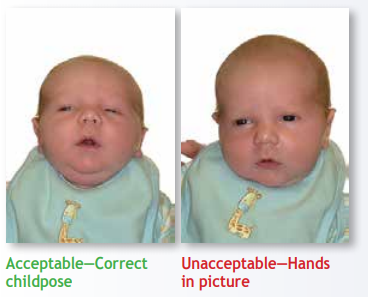 The two photos must be identical, unaltered and produced from a single negative or from a single electronic image file. Either black and white or colour photos are acceptable. The photos must be originals and not taken from an existing photo. Photos must be printed on plain, high quality photographic paper. Any other paper is unacceptable. The name of the photographer or studio, the complete address — street name and civic number (suite number, if applicable), town, postal code, and the date the photo was taken — must be provided directly on the back of one photo (see illustration below). This information should be stamped or handwritten by the photographer. Stick-on labels are unacceptable. Sufficient space must be allowed for the name of the applicant, the signature of the guarantor and the guarantor’s declaration. Photos must show the child’s head and shoulders only. Parent’s or child’s hands must not appear in the photo. 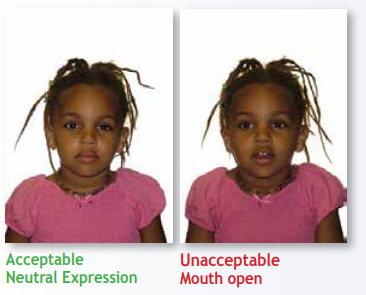 The Passport Program recognizes the difficulty in obtaining a neutral expression of a newborn and will allow some minor variations. For newborn babies, the photo may be taken while the child is sitting in a car seat, as long as a white blanket is placed over the seat behind the child’s head. There must be no shadows on the face or shoulders, around the ears or in the background. 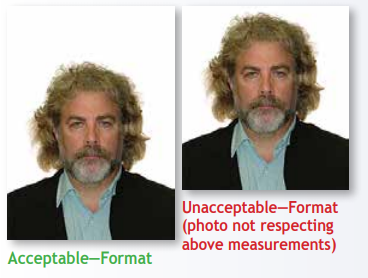 Photos must be taken in person by a commercial photographer and they must comply with the Passport Program’s specifications and requirements above. 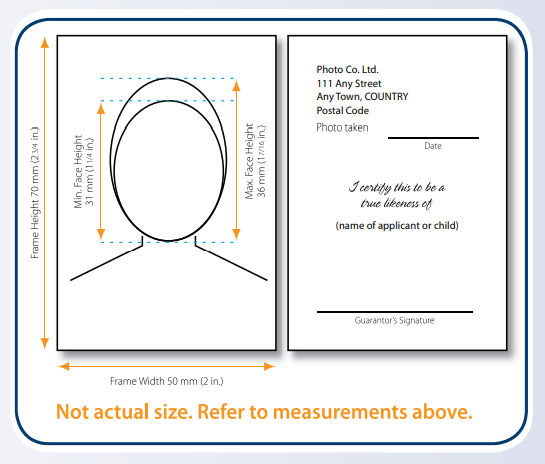 Standard paper passport photo formats in other countries vary and may not be acceptable for Canadian passport photos, such as (2 inches x 2 inches) in the United States. 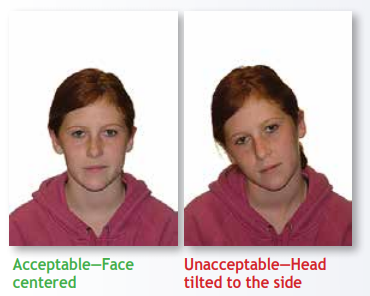 Wheelchairs: Passport photos must be taken against a plain, uniform white or light-coloured background to ensure that the applicant’s facial features and edges of the face are clearly visible. As such, for someone who is in a wheelchair, we recommend that the photo be taken with a plain white blanket placed over the wheelchair behind the applicant’s head. 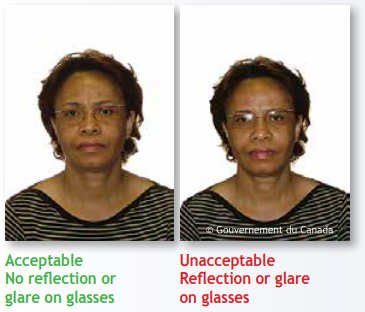 Headwear or nasal cannula: When required for medical reasons, headwear or a nasal cannula may appear in a passport photo— provided that the eyes remain clearly visible. We recommend that you include a signed explanatory letter with your application. The Passport Program may also request that you submit a letter from your doctor.